How often can I used the 1.0 mm dermastamp? I have learned that the 1.5 mm and deeper dermastamps should be used no more often than every 10-14 days. But, what is the appropriate frequency for the 1.0 mm dermastamp? Re: How often can I used the 1.0 mm dermastamp? This is answered on page 5 of our instructions. Every 10-14 days. It doesn't matter whether the needle is used in a dermastamp or dermaroller. Thanks. I guess I overlooked that. 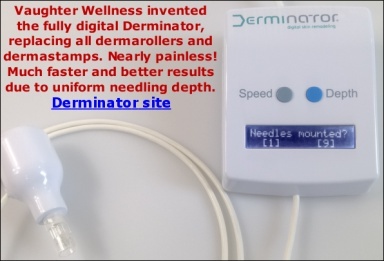 How many days do you need to wait to use a 0.5 mm dermaroller after using a 1.0 dermastamp when treating the same skin area? Put differently, can I still use the dermaroller 2-3 times a week in the same area being treated every 10-14 days with a 1.0 mm dermastamp?